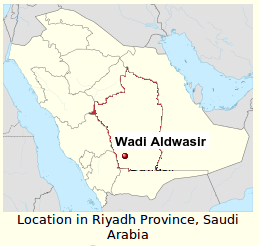 The recent uptick in MERS cases continues on this last day of January with an announcement of two unusual secondary, community-acquired MERS cases in Wadi Aldwasir. 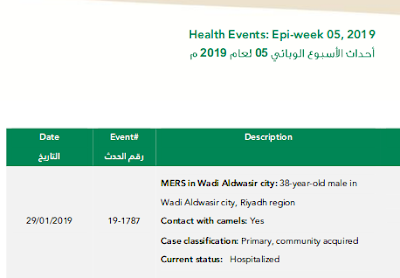 Two days ago, in Saudi MOH: 11th MERS Case Of 2019, the MOH reported on a 38 y.o. male from Wadi Aldwasir hospitalized with the MERS virus was designated as primary, community acquired with camel contact (see below). 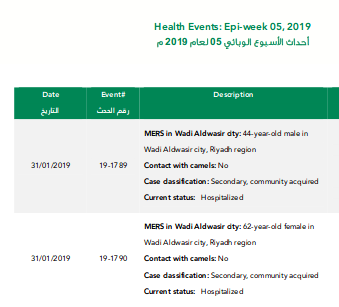 Without providing any specifics, today the MOH reports two more cases from Wadi Aldwasir - both of which are described simply as secondary, community acquired - which would seem to suggest a cluster not linked to a household or healthcare facility. 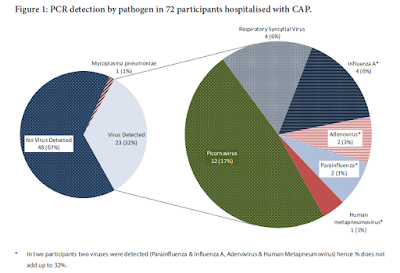 Clusters of MERS cases - particularly in homes or healthcare settings - have long demonstrated that in close quarters and under the right conditions, the MERS virus transmits reasonably well between humans. There are other venues - workplaces, for instance - where similar close contact could occur. The good news so far is in the broader community, overt clustering of cases has been quite rare, although there are concerns over undetected chains of limited (asymptomatic or mildly symptomatic) transmission of the virus. Until we get some specifics on this cluster, including the epidemiological links between cases, it is impossible to know how much added significance one should attach to this report. In all honesty, it could even be a typo. Hopefully details on these cases will be included in the next WHO EMRO MERS Summary, due out around the 10th of February, and we'll continue to monitor the region for any additional reports. Today's announcement raises the Saudi total to 14 for the month of January, and (assuming no more cases are reported today) a total of 18 for the month when you include neighboring Oman.